While the issue of divorce and remarriage is heavily debated, the follower of Christ must uphold the solemnity of the marriage covenant while rejoicing in the infinitely sufficient blood of Christ to forgive, cleanse and restore. In part 8 of Biblical Marriage: One Man, One Woman, One Flesh, Pastor Dan Cox reads from Matthew 19:1-12. In a spiritually mixed marriage, the follower of Christ has a unique opportunity to minister God’s love and truth to an unbelieving spouse and children. In part 7 of Biblical Marriage: One Man, One Woman, One Flesh, Pastor Dan Cox reads from 1 Corinthians 7:12-16. While God has made provision for divorce in certain instances, the follower of Christ is called to recognize and uphold the solemnity of the marriage covenant. 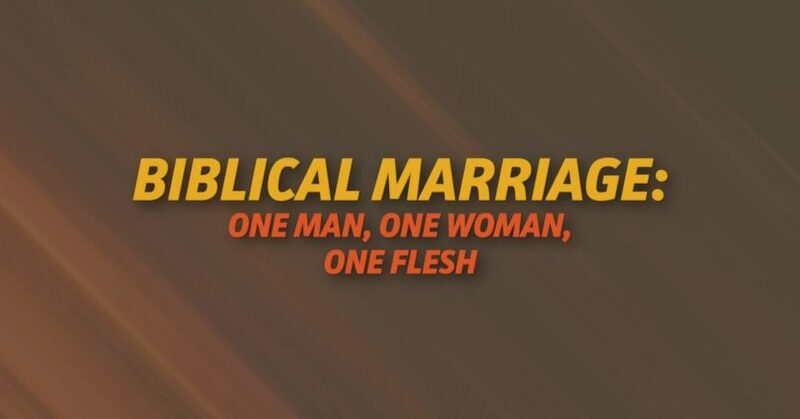 In part 6 of Biblical Marriage: One Man, One Woman, One Flesh, Pastor Dan Cox reads from Matthew 19:1-12. Followers of Christ are called to honor marriage and uphold the purity of the marriage bed. In part 5 of Biblical Marriage: One Man, One Woman, One Flesh, Pastor Dan Cox reads from Hebrews 13:4 and 1 Corinthians 7:1-5. Biblical marriage is a proving ground for reflecting God’s love. In part 4 of Biblical Marriage: One Man, One Woman, One Flesh, Pastor Dan Cox reads from 1 Corinthians 13. Biblical marriage is a profound illustration of the relationship between Christ and His church. In part 3 of Biblical Marriage: One Man, One Woman, One Flesh, Pastor Dan Cox reads from Ephesians 5:22-33. While there are advantages and disadvantages in both marriage and singleness, the follower of Christ is charged to find his or her ultimate joy and contentment in the Lord. In part 2 of Biblical Marriage: One Man, One Woman, One Flesh, Pastor Dan Cox reads from 1 Corinthians 7.